LIKE a tradesman needs his tools, a bearded man requires his. A toolkit of sorts, whether you’re a minimalist or a seven-step routine kind of guy, to pimp and preen his beard into a well behaved mass of hair. If you’re a less is more type of man, then a good quality comb or brush, and oil or balm, are essential. When looking for the right brush, quality is key and we assure you there is a vast difference in quality amongst combs, if you spend a little more than 99 cents on the cheapest comb at your local supermarket, your beard will thank you. Boar-hair brushes for example are better than synthetic brushes. The surface of each bristle is scaly and draws dust and excess product from the hair as you use it. The bristles also stimulate the natural oils (sebum) present in the scalp, and draw them along the hair shafts, essential for keeping hair clean, healthy, shiny, and protected. For gents seeking a simple comb, rather than a brush, bamboo is a great option – durable and enviro-friendly too. Two thumbs up. Just make sure you pick one suitable for beards, whats the difference? Generally a beard comb will have wider gaps between the teeth, this is more suited to the thick nature of your face foliage. Beard oils and balms are the beardsmans equivalent of hair spray, pomades and treatments for hair. They are the product that will tie it all together like nails to timber, maple to pancakes, bacon to….. well everything, you get the idea. Oils are the tool of choice for the bearded gent, and with good reason. Beard oil has exploded in popularity as it is designed to nourish, soften, scent and style all at once, why wouldn’t it? If your beard is particularly unruly then a balm is for you. Beard balm protects beards from the elements so is often the better option if working or spending time outdoors. Balms also condition the beard and can be used as you would a wax in your hair, to keep it looking sharp and maintained. You can however, take the best option as most men do and opt to use both, applying the beard oil when the beard is damp and the balm when you need style. If you have a little more time and money, then you’ll want to invest in a few nice-to-haves and extend your beard care routine with a beard shampoo or soap. A beard wash, shampoo or soap is essential if you’re using a lot of products on your beard daily. These are vastly different to the shampoos found in the aisles of the supermarket. A beard shampoo specifically designed for beards, which are silicone free, will remove built up dirt and product from your beard without stripping natural oils, which leads to dry, irritated skin. After you wash, you can also use a beard softener to, yes, soften your beard. A beard softener can be used like a conditioner and applied after washing your beard. We always recommend following a wash with a softener to detangle and smooth, but you can also use a softener on days you don’t wash your beard. Scissors are the perfect way to keep your style on point, we all know beard hair grows at different lengths and can sometimes be out right random in the way that it does. Once you have your style and look down, the best way to keep it is to simply snip the strays on a weekly basis. Don’t be afraid to invest some money in this department, you want a quality pair that you can rely on. Nothing worse than a blunt uncomfortable set hacking your beard up. And that’s it. 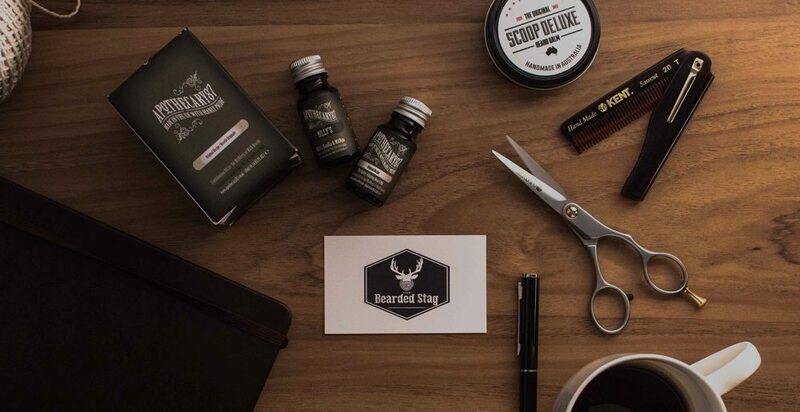 A few essentials for every bearded man’s tool kit. What do you have in your beardsmans toolbox? It is an informative and amazing blog for the the newbies like me,desire of having a perfect beard.